The Bloomingdale Trail, aka The 606, which opened in June 2015, is a terrific recreation and transportation amenity that serves four neighborhoods – Bucktown, Wicker Park, Logan Square, and Humboldt Park – on Chicago’s Northwest Side. While the blocks around elevated greenway had already been gentrifying before work on the trail began in August 2013, a November 2016 a report from DePaul’s Institute for Housing Studies found that property values along the western stretch of trail had gone up by 48.2 percent since the groundbreaking. Moreover, most of the vacant lots along the western half are being used to build single-family homes, which means that the population of the area will probably never return to its higher historic levels, when there was more multi-unit housing. The area is “under-zoned,” meaning that the current zoning doesn’t allow the construction of new multi-family housing to be built, and discourages the preservation of existing housing that’s affordable. 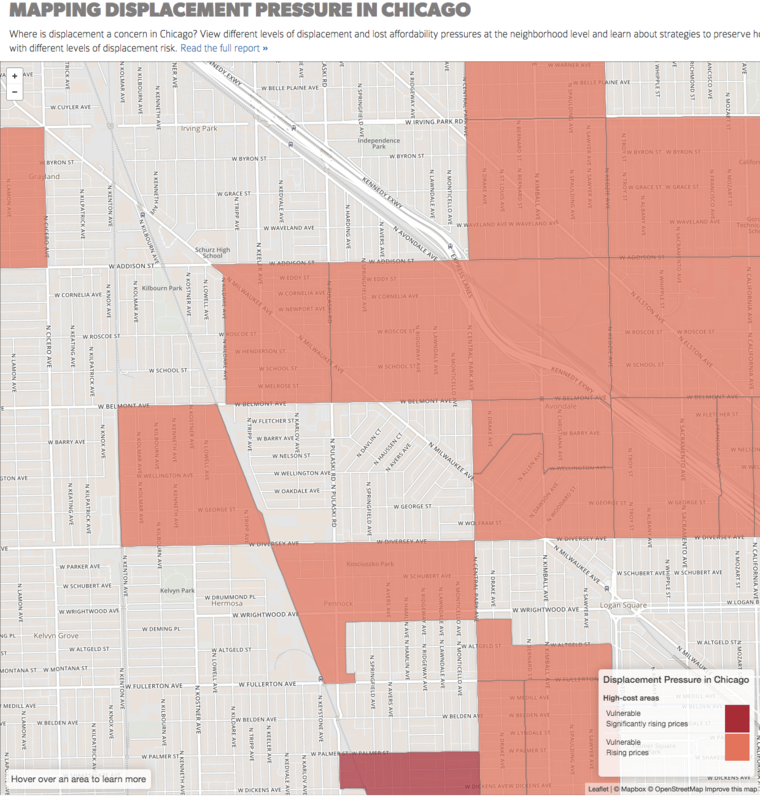 Fifty percent of the area within two blocks of the entire Bloomingdale Trail allows only single-family houses to be built “as-of-right,” without requesting a zoning change from the local alderman. Only 29 percent of the area is zoned to allow new buildings with more than one dwelling unit to be built as-of-right. The remaining 21 percent of the area includes “planned developments” (which involve additional city and community oversight, and usually have multi-family housing in them), plus parkland and industrial space. 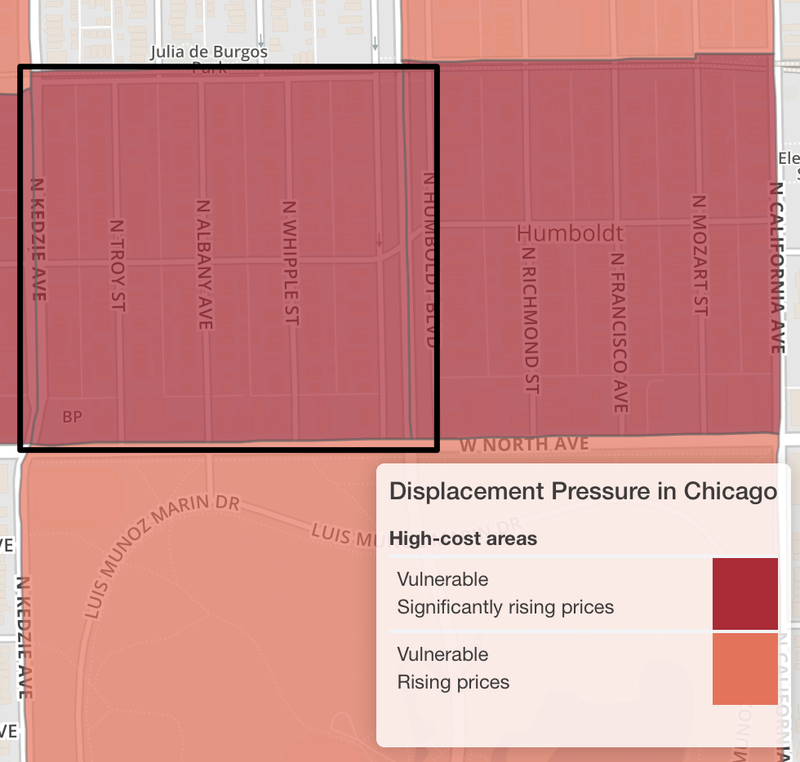 Census tract 2301, where I live, located just south of Julia de Burgos Park and the Bloomingdale Trail, appears on the Institute of Housing Studies’s displacement pressure map as a high-cost area. Let me tell you a little bit about the Census tract I live in, 2301, just south of Julia de Burgos Park, a 606 access park located on the north side of the trail between Whipple and Albany. I live a block away from the park and I love having convenient access to the greenway. As you can see from the map detail shown here, IHS’s study says that tract 2301 is a high cost area and there are significantly rising housing prices. According to the Census, 483 people moved out of my tract between 2000 and 2016. But the “zoning capacity” of the area wouldn’t allow the same number of people to return to the tract because it doesn’t allow for enough new housing units to be built to accommodate them all. The same thing is generally true for the adjacent tracts. The zoning designation RS-3, which allows only one single-family house per property, is the most common “zoning district” in my Census tract, covering 73.8 percent of the area. Multi-family housing can be built as-of-right on 25.4 percent of the area. But the current designation doesn’t reflect the kind of housing that already exists there. Many existing two-, three-, and four-flats in the area are “legal, non-conforming” uses on land zoned for single-family houses. Zoning also dictates how existing buildings can be modified. For example, if a single-family house is in a district that allows multi-family housing, the homeowner could renovate the basement into a rentable dwelling unit. In addition, the property owner of a multi-family building could add or split units. This zoning map of my Census tract shows the enormous area where the City Council allows only single-family housing to be built. During the same period that the population of my tract dropped by 483, the number of occupied housing units decreased by 4.4 percent due to demolitions and the replacement of multi-unit housing with single-family homes. In the 2015 property tax year, the Cook County assessor classified 17 properties in my tract as vacant land. Three of them are zoned to allow between two and four units depending on the lot size, and one is zoned to allow up to four units. The remaining lots are all zoned for single-family housing only. One of these vacant lots is double-wide, but since it’s zoned for single-family, only one house may be built on this large piece of land without a zoning change. If the maximum number of allowed units were built on all 17 lots, my tract would add 29 housing units. The current density of the tract is 2.7 people per unit. If the households that move into these 29 units maintained this density, 78 people would occupy these units. A three-flat is under construction on one of four vacant lots near the Bloomingdale Trail. 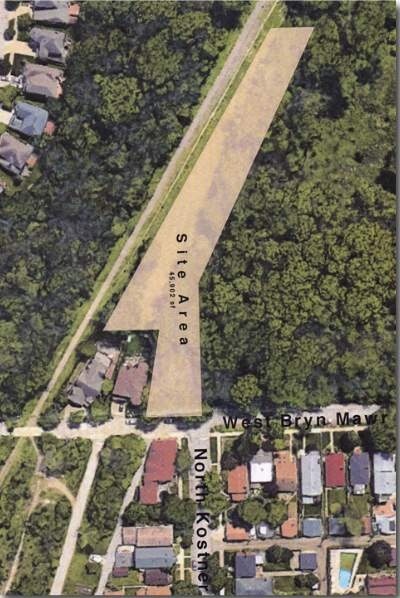 The zoning on the two lots closest to the greenway only allows one single-family house to be built on each lot. In October, Mayor Rahm Emanuel introduced and the Council passed two other ordinances with the stated goal of increasing the amount of affordable housing in gentrifying areas on the West and Near Northwest sides. One of the new laws, which went into effect on November 1, requires that developers of projects with 10 or more units set aside 15 percent of the units as affordable, instead of the usual 10 percent, and eliminates the option of instead paying a fee that goes to the city’s affordable housing fund. However, that ordinance will have no effect on the amount of affordable housing in my tract because the zoning doesn’t allow buildings this large. Since 2015, most of the vacant lots in my tract have been developed, have active construction projects, or were recently issued building permits. Two of the lots that allow multi-unit buildings have received permits for multi-family housing. The other two aren’t currently being developed. All of the single-family zoned lots are getting single-family houses. In addition, in some cases single- and multi-family buildings have been demolished to make room for new single-family houses, further reducing the number of available housing units. Good article Steven. It’s disappointing to see alderman push for down-zoning some of their neighborhood arteries (Ramirez-Rosa) while de-conversions are happening on side-streets. If zoning is going to require retail on arteries, you need people to support those stores. There are too many vacancies on some of our more vibrant P-streets already (near me: Broadway north of Diversey), what chance does retail on Halsted have? This zoning limitation is crazy, this is not the suburbs. But that said, at this point in time, if you were to permit the greater density I highly doubt you would even slow the displacement of the longtime residents and those of LMI, and you might in fact accelerate it. To wit, my parents’ first house was a 2 flat in Lake View, Census Tract 628. It has over twice as many residents as yours does, 3,500, and over twice as many housing units, with 1,611. The ratios appear to be consistent with your tract, in terms of units and residents. This density is great for many things; but that that extra housing supply has certainly done nothing to mitigate the housing costs. It in fact raised them, as that higher supply was outweighed by significantly higher demand. This is not an insignificant issue – more a multitude of reasons, a greater population of wealthy people tends to result in communities that are not necessarily less dense (see my old census tract), but that are most assuredly not diverse, economically speaking. This is the displacement that is cause for concern IMO. It’s not healthy or just to price the lower and lower middle class out of entire neighborhoods, we need not just more density but specifically more density of affordable housing stock, suitable for families. Ramirez-Rosa has down-zoned 2 areas on Milwaukee and I think for different reasons. But in either case the down-zoning is a means for him to take control of the ‘as of right’ to build on those major artery properties. For the property on Milwaukee and Spaulding (the former bakery) the owners (who were going to build market rate apts as of right) will have to go through zoning – that is him – and he can dictate the terms for approval. Knowing him those terms would include the addition of affordable housing. The other down-zoning on Milwaukee, between Diversey and Pulaski, is I believe at the request of some property owners on that street. I don’t know yet the story behind that one. I think his reasons are sound, the problem is that downzoning is the only tool he has to influence the development. The bigger issue is of course why we haven’t evolved beyond aldermanic prerogative, because what one alderman can easily put in place the next one can just as easily undo. My problem with that is once it’s downzoned, the alderman usually bends to the NIMBYs when they try to upzone it. If he were purely using it as a tool to push for affordability/developer concessions, I would understand. Steven Vance, I’m glad you mentioned coach house aka granny flats as this is an untapped potential for SFH neighborhood density. I surprised the aldermen aren’t even aware of this. Vancouver BC seems to be in the lead on this. They would be esp relevant in TOD areas. I don’t know if this is true but I was told recently that it was just 8 years ago that these structures were completely banned. Being a homeowner just outside the 606 area I would have been spitt’n mad if the alderman wanted to penalize me for deconverting my property – those demo costs would lower the valuation of my property and I’d take the hit should I decide to sell. The only compensation for me would be somewhat lower property taxes due to the lower valuation of my property. Small compensation. And then there’s the furniture factory at Lawndale and the 606 – why didn’t the aldermen push to get that converted to residences? The CHA is sitting on a pile of money and if not them then the city could have used some of that mayoral up-zoning, downtown money to finance purchase of this property. No one even batted an eye when a developer announced it’s going to be turned into a U-Store it type development. No, some aldermen completely ignore opposition from the community. In the 39th Ward there been opposition to zoning changes on Devon, to build a church instead of a restaurant, to build a shopping center on Foster and the Edens, and to change the zoning from POS to RS-3 to build housing along the river and the Weber Spur near Bryn Mawr and Kostner. If by character we mean affordability and economic diversity (in addition to historic preservation) then yes, I would say that stretch qualifies. You can see from the DePaul mapping tool that part of this stretch is high risk for displacement, and the other part looks like it will be there soon. I am also not really a fan of either this process nor the larger process in which Chicago handles zoning. Community meetings are so easily manipulated… the book “Street Signs Chicago: neighborhood and other illusions of big-city life”” by Charles Bowden and Lew Kreinberg should be mandatory reading for anyone interested in these topics. You only have to look at the area around Division and Ashland and the strip of Milwaukee from North all the way to Logan Sq and you’ll see the aldermen ignoring or just giving small concessions to the NIMBYs. Ditto the Fulton Market area. Personally I like the idea of the community being part of the process, after all living there makes them the subject matter experts. The 1st Aldi store development plan at Mil and the 606 was a mess – it basically blocked the entire 606 for half a block – and the community process forced the developer to amend his plans for the better. I think the press is part of the perception problem here – I’ve covered a number of these meetings and it seems the more ridiculous the NIMBY demands the more often they’re cited in the press as if that’s all that was said. The cooler heads that usually prevail at these meeting just aren’t interesting enough for an click-bait. I’m sure the zoning classifications don’t help, and the deconverting issue is obviously having impacts, but I think the SFH demand (which is sky high) is likely being driven by market demand instead of pure zoning restrictions. I’m not sure just opening up the zoning will result in multi-family rental units being built. I know friends that own three flats in Logan Square, and the market to sell them (unless deconversion is an option) is a lot tighter. Sure, they’re gaining value and the rental market is obviously high enough that money can be made, but I’d bet a developer can make more money right now building a high-end SFH on a vacant lot. As long as that’s true, that’s all they’ll build. Sorry, when I say “character” I mean: doesn’t fit in *our* neighborhood. Could be the height, number of units, facade, or too many affordable, Section-8 or CHA units. Neighbors in LP shot down the initial Diversey/Hampden upzone because it was being built on a private lot that they rented space in. Some even demanded the new building have dedicated rental parking for them because their pre-war buildings lack it. It’s insane. Now they are building as-zoned and we’re all probably worse-off for it. Meanwhile, the neighbors across Diversey, who this would also impact, didn’t get to provide input to Smith, because it’s not her ward. And for the record, I think that plan should have been rejected because of the monster SFRs they wanted to piggyback onto the upzone. Question: Do you (the author) use the terms ‘gentrification’ and ‘displacement’ as synonyms, or is there a distinction between the two words/phenomena? I’m just thinking that multifamily housing (both condos and rentals) can also be very expensive / out of reach economically for lots of folks. They don’t mean the same thing. Merriam-Webster defines gentrification as “the process of renewal and rebuilding accompanying the influx of middle-class or affluent people into deteriorating areas that often displaces poorer residents.” Our goal should be to figure out policies to ensure that when wealthier people move into a neighborhood, it doesn’t result in higher housing costs for existing low-income and working-class residents that force them to leave the area. In effect, that would be gentrification without displacement. How about connecting property tax rate to income? (As we do with income tax)? Lower income households pay lower property taxes. But then I wonder: what about low-income folks who own and want to “cash in” on the gentrification? I love community engagement, absolutely. But as it is an art and not science, it just does offer the hucksters plenty of opportunities to game the system. This is exactly the thinking behind swapping in a progressive municipal income tax for the regressive property tax. We have a ridiculous amount of our operating budget covered with property taxes – the latest mess with Berrios shows how the poor get screwed in our current system. I confess that I never thought I’d see the day a SFH would be worth more than a 2 or 3 flat, building materials etc being held constant. When we were househunting it was still the opposite (at least in Logan Sq and neighboring areas), there was a definite premium for two and three flats, reflected in the fact the banks factored in that rental income to your loan application. Has any place been able to successfully do that? It feels to me that a middle ground would be to amend the zoning laws to allow easier build-outs of existing SFHs into multi-unit. Offering an inducement to home owners to rent a room or floor to others would be a way to encourage “beathing room” where it is needed without having to rely upon “developers” to solve the problem. Not everyone wants to be a landlord but giving a nudge to those who might seems like a more human oriented solution than the restrictive measures being asked for. I think a middle ground is returning to previous higher-density zoning that was in many of our neighborhoods. I think accessory dwelling units are a great way to potentially double the density of a neighborhood without changing a “block’s character” because the housing is in the rear. “Granny flats” are a term based on actually having an apartment on your lot for your grandparents. There are a lot of thoughts in this comment and not all of them are particularly responses to what you’re saying, Carter. Zoning is only one part of the development equation. And it’s one where alders have complete control/influence and I think many of them are misusing it. Developers and property owners are major factors in that equation. What else is a factor? Moving the levers of property taxes and incentives. I don’t see how a situation where reducing the amount of housing, or fixing/freezing the current amount of housing, reduces housing costs. So far the best evidence that increasing housing supply reduces the rate, or the rate of growth, of displacement is this one from California legislative analyst’s office: Huge state, huge sample size, of all the housing construction during a 14-year period. I might apply the same analysis to another Census tract, near some of the Blue Line stations, and look at population loss, population capacity, and potential for growth based on zoning. The small area around train stations is where all growth should be concentrated. Near the California Blue Line station are some parking lots. Wanna have a parking lot near a 24-hour train station? Pay an “in lieu” fee just like developers who aren’t going to build on-site their required affordable dwelling units. The fee would go to the same affordable housing trust fund that the city uses to pay for people’s rents and to try and jump-start new construction of affordable housing. Liberty Bank at Milwaukee/Fullerton owns two massive parking lots, and a series of vacant lots south of there. Tax the unused land until they sell or develop it. Everything is already downzoned as it is, in Logan Square. Anything lower is harming current property owners and potential development. He can also use upzoning to make some land more attractive for development. He can also be a collaborator with developers instead of one against developers. How’s the development of the Emmet Street parking lot coming along? Or the former Pierre’s Bakery lot? Twice now Rosa has tried to give up his job as alderman in the last six months. I don’t think he’s a reliable partner in developing in the 35th Ward. I think that Carlos Rosa-Ramirez is ambitious, driven and smart and a good guy who is going to go far – but he does seem to have been distracted regarding the job he was elected to do in the ward. Let’s see what he does now that he can re-focus a bit more locally. think limiting development is going to reduce housing costs. done via larger community-driven master plans. TOD in and of itself is not a master plan. I would argue that it is far too easy to convert an existing three-flat to a single family home. You don’t need a zoning change for this, but you do to build a three-flat too much of the city. I’m not sure we’ve really seen supply and demand truly intersect except for maybe in the South Loop, where the zoning allows for densities that allow developers to truly cater to market demand. In most of the rest of the city, especially on the north and northwest sides where supply is limited (and actually falling, if we are talking about housing units as a whole), the demand is just not being met. Perhaps a three-flat doesn’t make as much financial sense on a typical 25-foot lot, I don’t know. But larger multifamily buildings like the kind we see on Milwaukee Avenue certainly do. And having a zoning code in place that makes it too easy to deconvert three-flats only exacerbates the problem. How Can We Keep Neighborhood Investments From Causing Displacement? A neighborhood assoiciation is arguing that "current infrastructure" can't handle approximately 120 more people moving into planned LGTB-friendly and transit-friendly affordable housing.